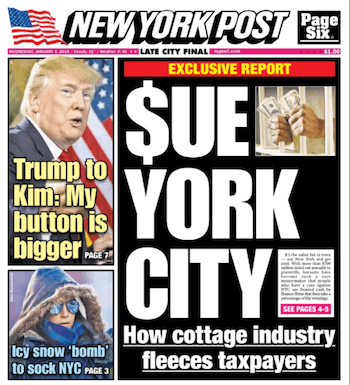 The NY Post last week published a front page story, Sue the City, casting aspersions on the personal injury lawsuit funding industry and one of its oldest companies, LawCash. Although the article’s deep misconceptions about lawsuit funding are hardly new, there is one element that is highly unusual: It quotes New York City Comptroller Scott Stringer and representatives of the NYPD as critics of lawsuit financing. To understand why anyone who cares about civil justice should be worried that these public officials are quoted, here’s some background. As the Post points out, New York City paid $722 million in civil claims in 2017, making it one of the largest defendants in the world. Stringer, as Comptroller, oversees the resolution and settlement of claims filed against NYC. In that way, his work is similar to the CEOs of Geico or Allstate who are also large repeat defendants of civil lawsuits. The goal of all these organizations is clear: Minimize payments to plaintiffs who sue them. The Post makes multiple references to “frivolous” lawsuits and certainly the Comptroller – and the rest of society – would benefit from baseless lawsuits being eliminated. However, the vast majority of lawsuits are meritorious: Real people who get hurt and are seeking remedy to make them whole. Said differently, without financing plaintiffs have two choices: They can either sell 100% of their case (settle the claim) at a price the defendant sets, usually for pennies on the dollar or they can wait the years it takes on average for a case to resolve, all the while trying to overcome the physical and emotional damage from the accident (which includes second and third-order consequences, such as injuries that prevent someone from working). The delay in case-resolution is even worse in NYC’s boroughs, which have some of the most backed-up courts in the country; it is not uncommon for some cases to take over five years to resolve. Enter financing. It enables a plaintiff to sell a small percentage of the future proceeds of their case to one of many competing funders, typically to pay for living expenses such as rent and food, while they wait for a fair offer to sell the rest of their case to the defendant. It’s no surprise then that defendants feel threatened. Plaintiffs can now access valuable liquidity, empowering them to make decisions free from duress. It sounds simple, but for plaintiffs it gives them real agency and power. Plaintiff financing introduces a threat to defendant’s monopsony power: competition. And that costs defendants money. Large insurers (aka professional defendants) have been responding to this innovative form of competition in a predictable way: They are doing to it what the taxi industry is doing to Uber and what the hotel industry is doing to Airbnb. They’re using their enormous checkbooks, political influence, and public relations sway to try and lobby and legislate it out of existence. But they are private companies and so they can rationalize these actions, which primarily hurt poor plaintiffs, by arguing it’s in the best interest of their shareholders. Publicly elected officials are different, though. Elected officials have a civic duty to their citizens, not a fiduciary duty to their shareholders. Just because plaintiff financing may cost the city more money by empowering poor plaintiffs to settle less frequently for lowball settlement offers doesn’t mean that it’s not the right thing for the city and its people. I doubt the NYC Comptroller would ever advocate against hiring more judges to fix the backlog of civil cases, even though it would likely be an effective way of further reducing what NYC pays out in settlements. But “funding lawsuits” is an easier scapegoat. Lawsuit funding has the facts and the law on its side. But when NYC elected officials join the insurance lobby in trying to pound the table, it opens up a new front in a war that ultimately will hurt the very citizens they are responsible for protecting. The Post vastly overstates the problem of frivolous litigation. But in the spirit of trying to be helpful to the city, I’ll offer a suggestion. One way to empower NYC to fight frivolous lawsuits is through getting litigation finance themselves. Although less common than personal injury plaintiff financing, I bet NYC could find an entrepreneurially spirited litigation funder who would partner with NYC to privately defend frivolous suits in exchange for part of the savings. This arrangement, like most litigation finance arrangements, would be economically efficient for the parties involved and for society as a whole. The Post is likely correct that lawsuit funding costs NYC taxpayers money. But it conflates correlation and causation. It’s not because it encourages frivolous litigation. It’s because if poor plaintiffs can access financing they won’t have to take early, lowball settlement offers from NYC. If you’re a New Yorker who is one of the 76% of Americans who can’t come up with more than $500 in the case of an emergency, and you get hurt, your settlement is likely going to be less than that of a rich New Yorker. It’s expensive to be poor. Lawsuit funding corrects that imbalance by transferring wealth from rich New Yorkers to poor. 150 years ago, liability insurance faced similar criticisms at plaintiff financing does today. The public was put off by the repugnancy of liability insurance, believing it was bad for the justice system because it introduces a third party to a claim, incentivizes people to act more recklessly knowing other people can clean up their mess, and distorts settlement offers. Relatedly, it’s ironic and audacious that liability insurers are the ones backing the assault of the plaintiff financing industry. I talk about that irony in a speech I did recently. The Post article could have been written anytime in the mid-1900s arguing that the contingency fee arrangement is repugnant and costs NYC taxpayers money by enabling plaintiffs who wouldn’t have otherwise sued, to do so. The Post article cited the rates of return that companies in the industry charge. 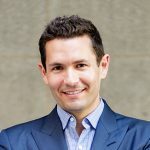 While I don’t know and therefore can’t comment about the specific numbers they used, overall, increased competition and natural maturation of the lawsuit funding market has dramatically decreased prices over the past decade. That will undoubtedly keep happening. Still, there is no arguing that rates of return charged to plaintiffs who receive financing are typically more expensive than the rates charged by most traditional financiers. But just because something is expensive doesn’t mean it’s a bad deal. Let’s do some math to find out why. The average financing a plaintiff receives is less than $5,000 and often much less. Let’s assume a plaintiff takes that $5,000 at the time she would have otherwise taken a lowball settlement offer of $20,000 from a Defendant if that financing hadn’t been available. Now assume that she later goes to trial and the jury awards her $100,000, which is what they consider to be fair in order to make her whole from her injuries. Even if she had to pay back $15,000 to the financier, which would be a 3x return, she would still have made much more overall ($100,000 settlement – $10,000 financing cost > $20,000 lowball settlement offer). Moreover, there is nothing stopping non-profits from coming into the space and offering the product for free to plaintiffs. It’s basically the same value proposition (ensuring justice) to the same audience (plaintiffs) as legal aid. It’s all third-party financing. Or a better solution would be for insurance companies to give fair settlement offers early in the process so that nobody would need financing. The Post article reminded me of a NY Times article a few years ago called “Rise in Loans Linked to Cars is Hurting Poor.” Read that article first. Then read the Washington Post’s Volokh Conspiracy takedown of the article. We previously wrote about how Volokh’s defense of title loans is very analogous to what supporters of lawsuit funding argue. Plaintiffs who receive financing are represented by counsel, and counsel has to sign an agreement acknowledging their clients understand what they are getting. To repeat, consumers are represented by counsel when they get lawsuit financing–a higher level of oversight than most situations in which consumers receive financing. I’ve never heard a critic of giving plaintiffs the option to get financing answer this question persuasively: If an injured plaintiffs can choose, with the advice of counsel, to sell 100% of their case to the defendant early in the case for a low-ball settlement offer without the need for government intervention, then why should the government intervene when plaintiffs, with the same advice of counsel, choose to sell a small part of their case to competing third-party investors in order to not be forced to settle the whole thing for a low-ball offer? By the way, I am pro-regulation, just not the market-killing, transparently self-serving kind that the insurance companies are pushing for here.